Senior veterinary student Ryan Brock conducts surgery during a daylong clinic providing castration surgery to 23 stallions at Dumb Friends League Harmony Equine Center. Nigel Miller, a fellow veterinary student, paused while examining the incision between the horse’s legs. “Doing all right up there, Kate?” he asked, to confirm that the patient was well sedated. 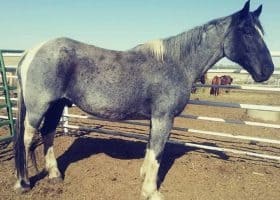 The students were in a group of three Colorado State University veterinarians and eight fourth-year trainees castrating young stallions at the Dumb Friends League Harmony Equine Center near Franktown, south of Denver. 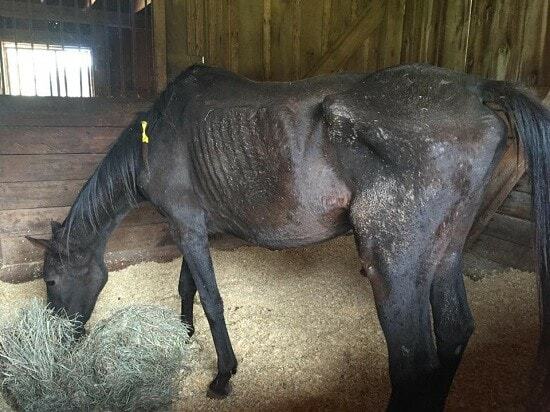 Just one month ago, the rehabilitation center accepted 59 abused and neglected mares and stallions that authorities seized among more than 200 American Quarter Horses from a farm in Conroe, Texas, north of Houston. 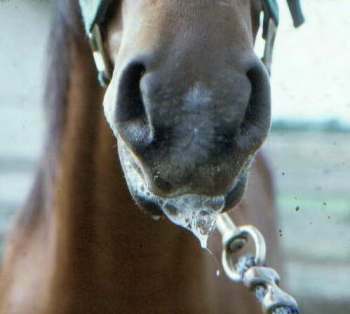 And then, for the stallions, castration. The procedure, like neutering a male dog, prevents unwanted offspring and calms aggressive behavior. 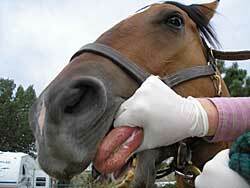 The surgery is thus required for all stallions that arrive at Harmony Equine Center. 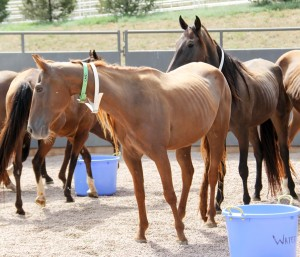 In about six hours, the CSU veterinary team would castrate 23 rescued horses. They worked on three horses at a time, the students taking turns handling, administering anesthesia and performing surgery. As he talked, Bass oversaw a student at work, cutting and clamping with an emasculator. “Another brain surgery,” he remarked lightly, referring to the animal’s newly acquired ability to focus on something more than procreation. Meanwhile, in another team of students and instructors, Marley checked her watch, eyeing the time her patient had been under. 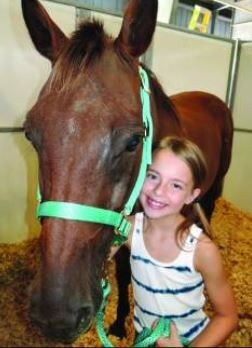 Miller, her partner, investigated the gelding’s 4-inch incision, looking for the source of a slow blood leak. Dr. Chuck Whitmer, a veterinary intern, sat on the ground holding a hind leg out of the way with a lead rope wrapped around the horse’s hock. Finding, clipping and clamping the leaking vessel would avoid hemorrhage and allow for speedy healing. Soon, Miller, wearing surgical gloves, found the source of the leak. 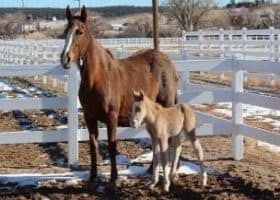 “If you need to, you can ligate that little guy,” said Dr. Elsbeth Swain, another veterinarian with the CSU Equine Field Service. She observed closely as Miller wound surgical thread around the leaking vessel and prepared to clip off the end. “As proximal to the body as you can get,” she coached, as Miller then stanched bleeding with a hemostat. He dabbed with gauze, noting that blood flow had stopped. “I’m OK with it,” Miller said, nodding to his instructor. 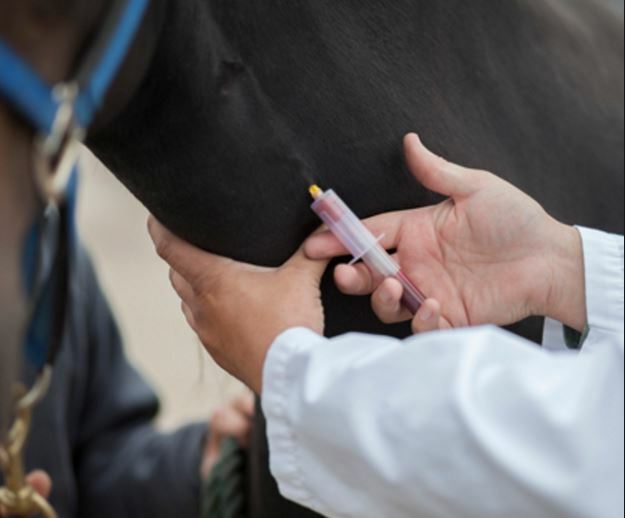 Castration incisions typically are not stitched in horses, she explained, as veterinarians have found that complete healing occurs quicker without sutures. Waiting for her patient to rouse from anesthesia, Marley noted the value of the surgical clinic for veterinary students. With proper technique, castration is among the simplest surgeries – barring hemorrhage or another problem. 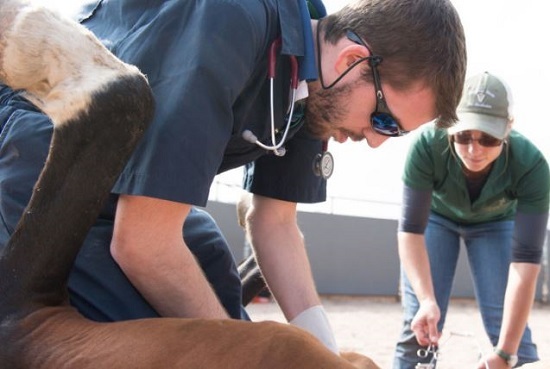 “The actual process is not complicated, but the complications that can occur because of it are why we go to vet school,” Marley said. 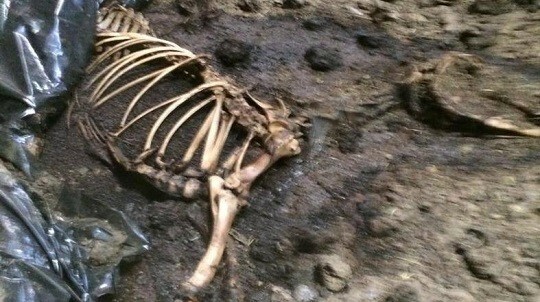 After about 30 minutes under anesthesia, her patient began to wake; it was time for the horse to stand, a precarious process for an animal that rarely had been with people. Marley snatched veterinary supplies and stood back. Whitmer grabbed the lead as the gelding clambered to his feet, rushed forward in fright, stumbled sideways, then stood swaying drunkenly and blowing air in loud huffs. Miller hung on to the animal’s tail to steady him. 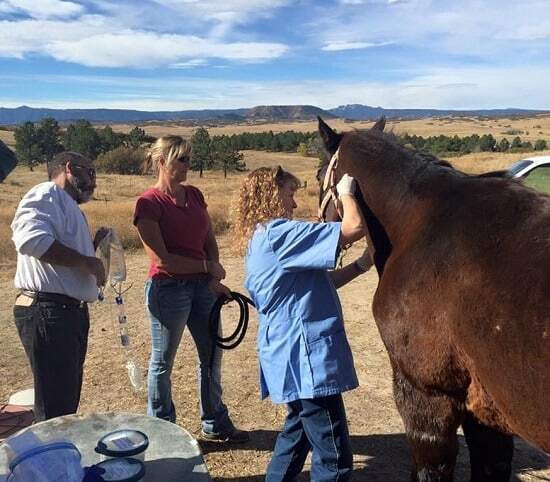 With help from Harmony staff, the gelding soon faltered to a holding pen, and it was time to ready the painkillers, iodine wash and instruments for another patient. 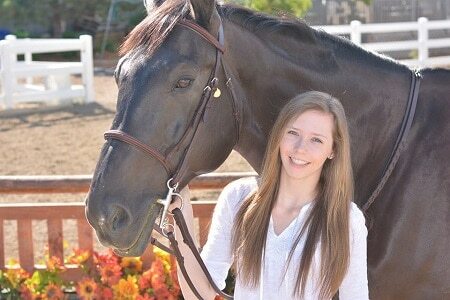 Moving to another surgical team, Swain quizzed student Katlin Hornig about effects of the day’s anesthesia cocktail on equine blood constriction and heart rate. 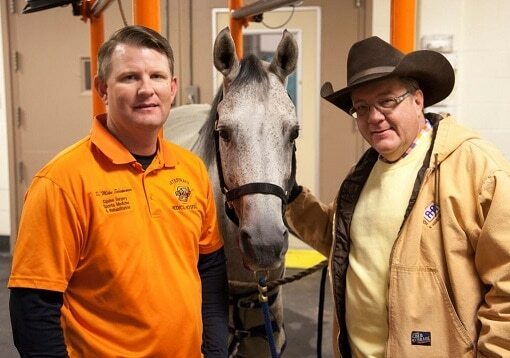 Hornig was taking a turn as field anesthesiologist on a young stallion’s front end while on the hind end classmate Blake Aiton conducted his first solo castration surgery under Whitmer’s supervision. Hornig is a high-achieving scholar, rising scientist, and through-and-through country girl who grew up with draft horses on a farm in southern Colorado. She has assisted with castration surgeries since she was a little girl, yet enthusiastically discussed the day’s drug protocol – made up of xylazine, ketamine and diazepam – with her veterinary professor. Aiton, wrapping up his turn at surgery, said he hopes to move to rural Montana after graduation to practice veterinary medicine for cattle ranches. He anticipates castration surgeries for ranch horses, likely performed alone with his patients in a remote pasture. 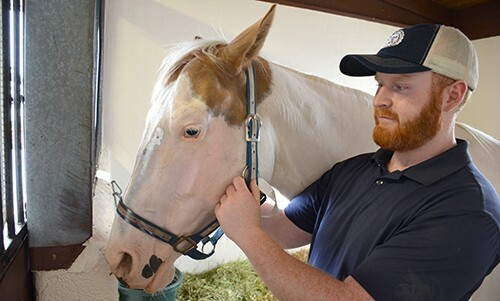 Preparing with multiple procedures in a row at Harmony Equine Center is “a great experience because it’s a controlled environment, you learn what to look for, and you can get your rhythm,” Aiton said. 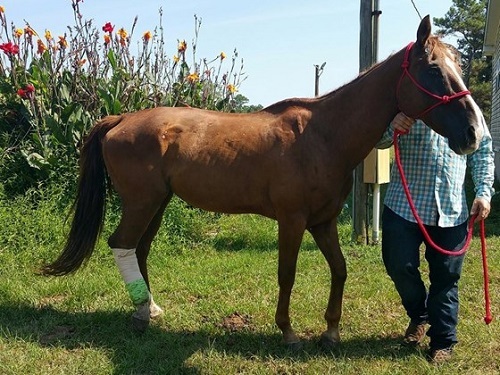 Beyond the day’s learning experience, the students understood the impact of their work on their patients, two dozen horses not carefully bred for beauty or performance, yet holding potential as fine riding companions. “It’s really satisfying to know that we’re helping these animals,” said Cami Gonzalez, who wore a Life is Good cap embroidered with a horse head. 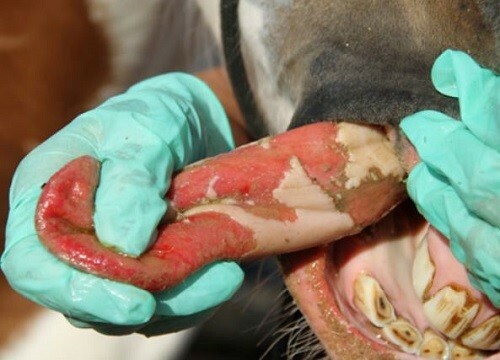 She had just removed a wolf tooth, a kind of rogue premolar, from a horse’s upper gum to prevent pain – the first time she had done the procedure. 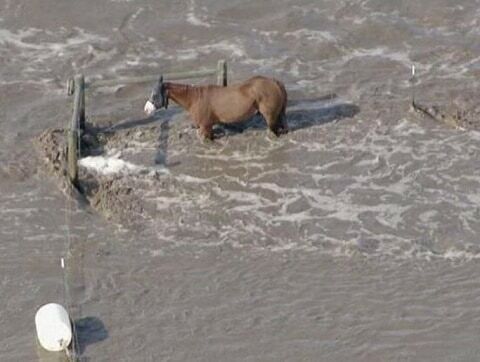 Just as the veterinary team completed work on their 23rd patient, a downpour began. The group gathered supplies, munched pizza and slugged Gatorade as rain hammered the barn roof. 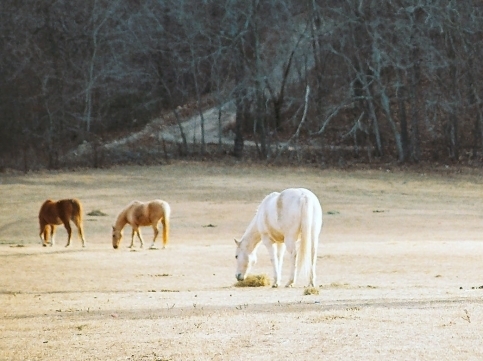 Garret Leonard, director of the Harmony Equine Center, asked the group to circle around. As veterinary student Kevin Lavelle headed toward the university van, he stopped to consider the day. “It can’t be replaced,” he said.